Cortana in-depth: What can Microsoft's assistant do for you? For many people, Cortana in Windows 10 will represent their first encounter with so-called virtual assistants who have been making our lives easier on mobile for years now. Cortana, which takes its name from an AI in the popular Halo series, is much more than a simple search feature so if you are willing to take the time, it can transform your Windows 10 experience into previously unseen territories. Many users will simply disable the assistant and forget about it until the end of time and while that is perfectly fine, today I am going to show you what Cortana can actually do so you can make up your mind once and for all. Cortana has been marketed so strongly that one could be forgiven for thinking that it will be making an appearance all the around the world. However, the truth is that making a virtual assistant work with a single language is already hard enough so expecting Cortana to work with the 111 languages that Windows 10 supports is a bit of a stretch. Cortana works with English (UK, US, Australia, Canada, India), French, German, Italian and Spanish. In order for the personal assistant to work, your system needs to be set in one of the supported languages, regardless of your actual location. 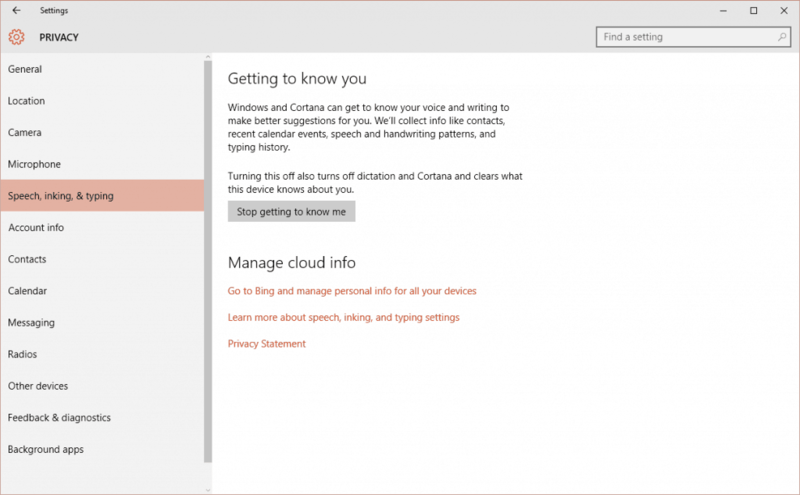 Furthermore, Cortana needs you to enable some privacy settings otherwise it will simply refuse to operate. First, go to Settings > Privacy > Speech, inking & typing and make sure that the “Getting to know you” option is turned on. After that, go to the Location menu of the privacy settings and turn the feature on too. Do note that by turning these two options on you will also be sending a great amount of data to Microsoft’s servers. The privacy implications are very real so it is really up to you. As you have probably noticed already, Cortana’s searches are hybrid, meaning it can search for stuff in your local drive as well as the Internet. By default, the search engine Cortana uses is Bing but you can change that as I have shown you here. 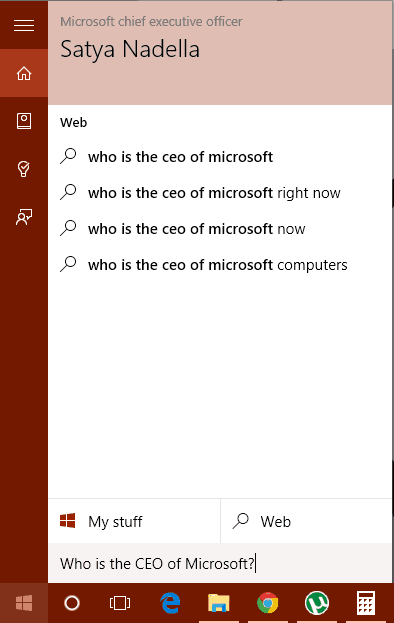 The local searches are exactly the same as previous versions of Windows despite the UI changes so there is not much to talk about there. What we are interested in here are the web-based searches which are vastly different than what you may have seen in Windows 8x with Bing. As far as online searches go, Cortana can be used much in the same way you are currently using your favorite search engine (like Google). You can ask it simple stuff like what the weather is like, what the time is in other regions, when is next year’s Mother’s day and more. You can also ask it more complicated stuff but the results are very inconclusive. For example, asking about the CEO of Microsoft will instantly tell you about Satya Nadella but ask about any other company and you are out of luck, at least in my case. Anything that does not come up in Cortana’s search box can instead be retrieved via Bing or via some other search engine if you follow our guide. 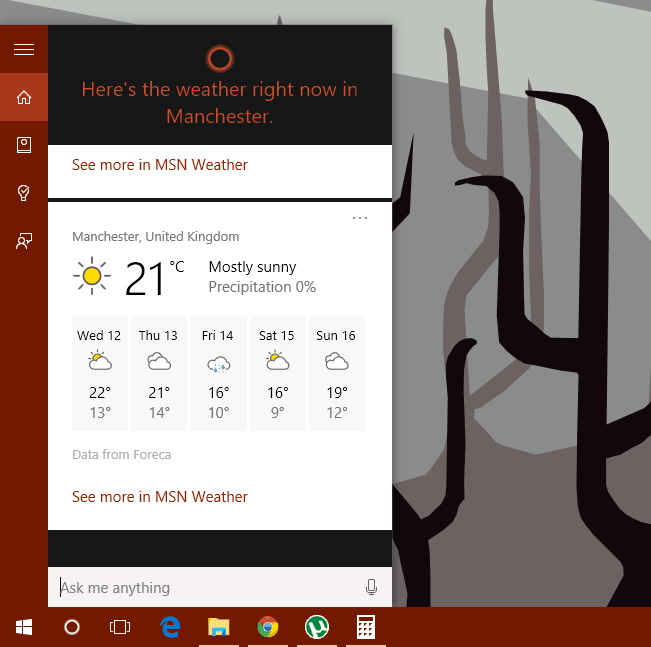 Those of you who have an Android device with Google Now should instantly feel familiar with Cortana on Windows 10 as much of the information is delivered in cards. This is also where the “personal assistant” part of Cortana really shines through. The virtual assistant has a few main categories which it uses to offer you all kinds of information. These include movies and TV, sports, eating and drinking locations, navigational directions, weather reports, reminders and more. To view them all you can open Cortana then click on the second icon (Notebook). This will open up the cards list and will also let you configure each and every one of them individually. For example, I am not interested in anything that has to do with sports so I simply disabled the card. On the other hand, I want to get weather reports for two different locations so I went to the Weather card and now follow one more city in addition to my current location. Some cards, like the weather ones, will always be present as soon as you open Cortana while others will be presented at ideal times. The more you use Cortana, the more it actually learns about you and that is the only way it can actually deliver relevant information to you. This is especially true for the more detailed categories like movies as otherwise Cortana would simply throw every new trailer in your face and hope that it lands something worthy which would not be the best experience really. If you see a category that you are really interested in then I would suggest clicking on it immediately as you will be able to fine tune the incoming information to better suit your interests. Before we start on this path, let us get one thing out of the way: talking to your PC/mobile device will never look cool. It is an undeniable and fundamentally human truth that you are going to have to deal with because voice commands are awesome with virtual assistants and Cortana is not really different. Voice commands work with even more specific queries and there are some features that you can only access with your voice. For example, you can ask Cortana to open any app for you, play a song, control your playback and even turn on specific system features like your Wi-Fi. There are plenty of ways to initiate a voice command. The first is to click on the microphone icon in Cortana’s search box. The second is to press WinKey + C and then speak your command. The final option will allow you to say “Hey Cortana” at any point followed by your actual command and the virtual assistant will always be there. 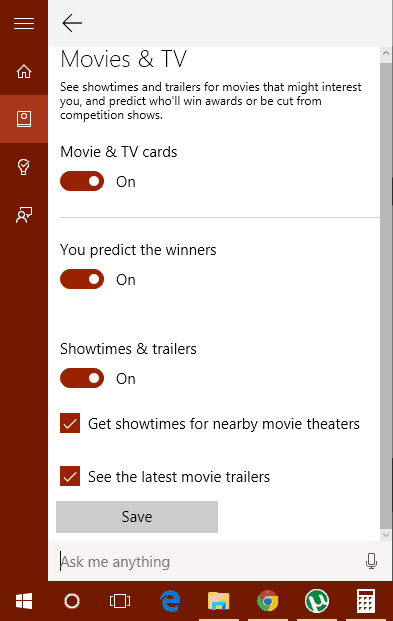 That last option is definitely somewhat creepy but considering the fact that all Cortana data is already sent to Microsoft’s servers, this feature is more like the cherry on top. No matter how you slice it though, lying on the couch while changing songs with your voice is quite amazing. 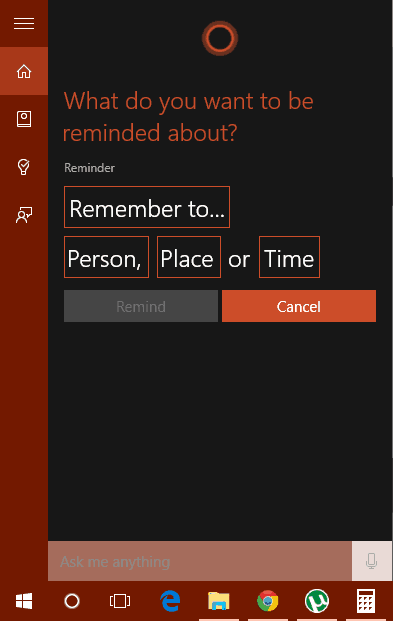 Even though I could include this part somewhere else, Cortana has a dedicated section for notes and reminders so I figured they deserved such a section here too. 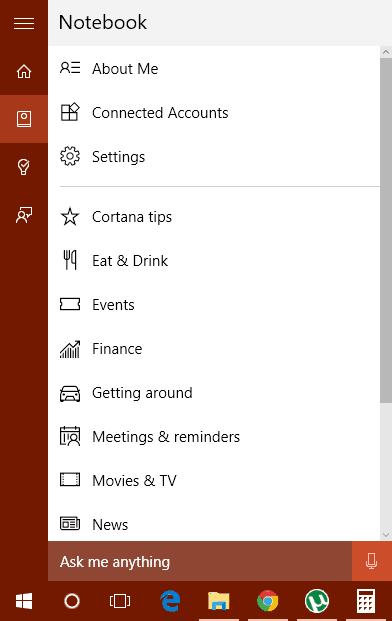 Apparently, Microsoft takes reminders very seriously and you can see for yourself by clicking on the third icon in Cortana’s UI. Here you can view your current reminders but if you do not have one, click on the Add (+) button to see the process. The first field will let you type your message, the second one will let you choose a person from your list of contacts, the next one will let you set location-based reminders while the final option will simply let you pick the time. Perhaps more interesting is the fact that Microsoft has followed Google’s steps and will now tap into its other services to gather relevant information about you, including flight info and other reminders. So if you get an email in your Microsoft account that asks you to be somewhere at a specific time, Cortana will most likely know about it, unless you disable the feature of course.